Red-hot and red-headed, he's looking for adventure on the mean streets of San Francisco and New Orleans! 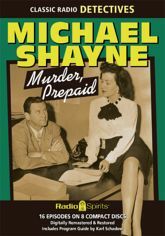 He's Brett Halliday's hard-boiled creation Michael Shayne. This rough and reckless Irishman is letting loose in this collection of sixteen pulse-pounding dramas starring tough guys Wally Maher and Jeff Chandler. Cathy Lewis co-stars as Phyllis Knight, with Joe Forte as Homicide Inspector Faraday, and Jack Webb as Homicide Inspector LeFevre.